>Who of you would like a pot of gold? Or your dream job, a good degree, a trip around the world or just anything else that you really want to achieve? Well the story has it that a pot of gold is usually at the end of a rainbow. Me and my fried, JC from AIESEC LSE, once came up with a framework to set and achieve your goals that we called the Rainbow. I was speaking about this concept at one conference some time ago and I would like to share it with you today. When we decide to do something, we usually think only about the end result. A good job, a party or any other idea we might have. But how many times do we really make it happen? Way too often, it is just something we talk about, but we do not act on it. Why? Because it is too intangible, too distant, our brain simply stops working at the thought of it and we give up. Sounds familiar? At least that is what I have seen with myself and with many other people that I have worked with. 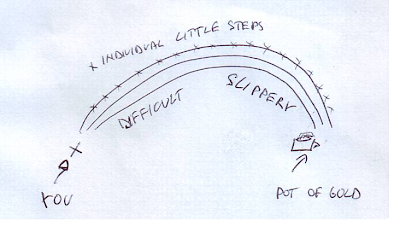 From my experience, it is not possible to get to the pot of gold with just one giant step. Yet people are often searching for that one step, that one action that will make things happen and that will get them where they want to be. When they do not find that one step, they give up. They forget that in order to get to a pot of gold, one needs to walk on a rainbow. How does one walk on a rainbow? 1. Take only very small steps. 2. At the beginning it is uphill and therefore very difficult. 3. By the end it is downhill and therefore slippery, one can easily fall. Break the task into a series of very small actions. Make them as simple as possible. The most important thing it to get walking, to take the first step. Do something easy today, that will set you on the track. And then take one small step every day towards your pot of gold. It can be as simple as calling a friend for advice, reading an article on the topic or writing down your thoughts. It does not matter that much what it is as long as you take one small step every day. 2. At the beginning, it is uphill and therefore very difficult. It will not be easy at the beginning. The goal will seem to be too far away, too unrealistic and it will also be difficult to actually figure out how to get there. But that should not put you off. Just keep walking, one little step at a time. And then you finally figure out how to do it. You get to the middle of the rainbow, you get halfway there and the pot of gold seems to be closer than ever. But be careful at this point. Lot of people think they are almost there, they start running towards they end goal (read they get comfortable about achieving it) but because the rainbow is now downhill and slippery, they fall. They underestimate the situation, they stop focusing, they get off the track. 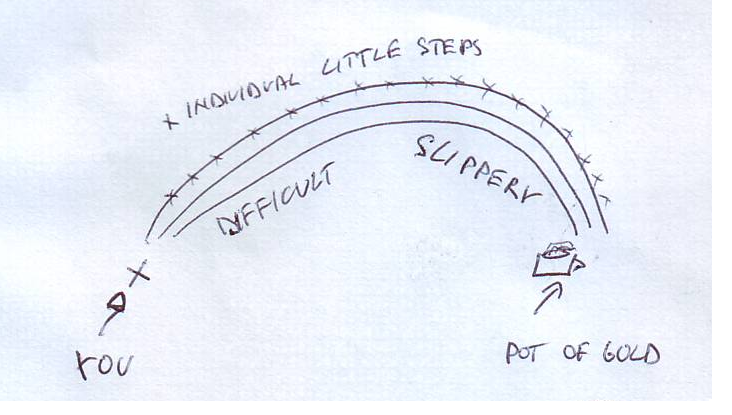 It is therefore important to keep taking those little steps every day, one at a time, until you reach your pot of gold. Only when you are holding it safely in your hands, you can have rest. Unless you spot a new pot of gold in the meantime obviously. Next time I will write a post about what I have recently read in a book called Getting Things Done by David Allen and what nicely ties with this concept.